Not sure if my patio was previously sealed with. Does this stuff work on solvent based ? If the current sealer is still beading water, then no. If it is porous and does not bead water, then yes. Using in an indoor space concrete slab with brush finish just need water sealing and ability to mop... is this the stuff? Also does the pump sprayer mater or could it be a hand pump sprayer vs an airless mechanical? Also is this sold in stores? The pump sprayer is the correct way to apply. This product will work for your scenario. 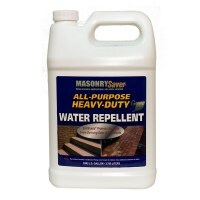 If I apply MasonrySaver All-Purpose Heavy Duty Water Repellent on painted stucco wall, can I thereafter an any time frame repaint the stucco wall? 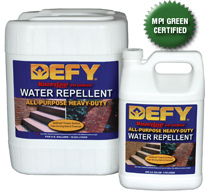 This product cannot be applied to a painted stucco wall. I have always sealed with a solvent based product. I live in WI and want a product that I could use on my driveway as well as my garage floors. There currently is a solvent based sealer in these areas? Are you just trying to seal the pavers or seal and enhance the appearance with a wet look and/or shine? First I want to thank you for getting my back order to me on time. I was power washing my drive when the FED X truck arrived with my 10 gallon order. The next day when the drive way was good and dry I applied the DEFY as instructed and waited a day for it to completely dry before testing it and boy was I amazed the water just beaded up and ran off and my drive way still looked dry. Thank you for a Great product. You show 75-150 per sqft. For concrete But the directions how 150-300. Which is it? I have 1800 sq ft oc Concrete. It varies based on the porosity. 150 per gallon is normal. Is five gallon container ready to use? Can it be applied by a paint roller? Hi John, we already replied to this question. See below. Is this premixed or do you have to mix it yourself? Can it be applied with a roller? Best to apply with a sprayer but it can be rolled. It is pre mixed. This product require one coat. About 5-7 gallons for this.